Wenger's not retiring. In his shoes would you? Arsene Wenger's the latest top manager insisting he won't retire anytime soon despite turning 60 next month. The highly-strung Professor Genius, who's cluster of teenagers weave pretty patterns without winning silverware, concedes life without football would be inconceivable for him. Do you remember when Sir Alex Ferguson announced his retirement as Manchester United boss? That was EIGHT years ago! Since then, United have won another Champions League and a hat-trick of titles. Even Fergie's Fledgelings, Gary Neville, Paul Scholes and Ryan Giggs remain key United figures - in their mid-thirties. If you look at how Fergie jigged along the touchline as United edged City last Sunday, retirement must be as far away in his mind as ever. The Gunners chief is going to be around for a while too. He once said he'd stop at 50. Now the Alsatian's barking another tune. "I don't believe in retiring unless you have to. I have never had a day when I think I could live without football. I know one day it will happen but you shouldn't live every day knowing you are going to die - you live knowing that you want to live." Wenger went on to point out that other people will let him know when to call it a day: "In our job you need physical strength and to be a bit of an animal to convince people it's important to win. "But you need in some way to be an animal and you need physical power. You will know if you are not hungry enough any more but other people will tell you if you are not good enough any more. 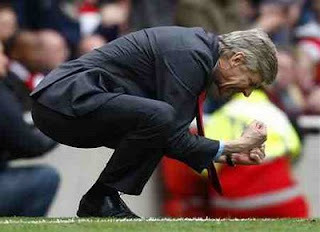 Wenger still classes going the whole season unbeaten in 2003/04 as his lasting legacy in football. "Without a doubt going the whole season unbeaten is my greatest achievement. If you win the championship you feel someone else can come in and do better than you. "It was always my dream to go the whole season unbeaten because there's not much more anyone can do to beat that." Football is a constant challenge for top managers, the strategy keeps their minds active and goal celebrations must the best possible feelgood buzz. Even Sam Allardyce's setback at Newcastle couldn't keep him down. Blackburn Rovers are the beneficiary of his desire and will to win. Despite years of success at Arsenal, Wenger's job is far from done. By KEVIN HATCHARD. My colleague from Sportsmedia. A superb radio and text journalist. Kev explains why George Burley should've walked as Scotland boss. 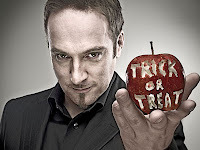 The superb illusionist Derren Brown has set tongues wagging this month with his prediction of the National Lottery numbers, but I would argue there’s been an even slicker piece of misdirection recently. 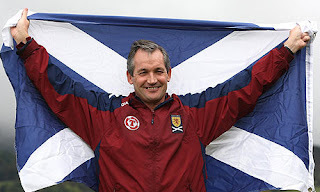 Somehow George Burley has hypnotised the Scottish Football Association, and convinced them he’s the man to spearhead Scotland’s bid to qualify for Euro 2012. He’s conjured images of pride, passion, and a narrow failure to make the World Cup qualification playoffs. Time to shatter some illusions. This failure was not as agonisingly heroic as Burley would have everyone believe. Even if Scotland had won their final qualifier against Holland, there’s no guarantee it would have been enough to make the playoffs. Indeed, Norway finished second with a meagre return of ten points, and look set to miss out on the playoffs as the runner-up with the worst record. Scotland’s results in arguably the weakest qualification group were frankly pitiful. The campaign started with defeat in Skopje to a pedestrian Macedonia side ranked more than twenty places below them, and it says a lot that the laboured 2-0 win over the same opponents at Hampden was seen as one of Scotland’s best performances of the campaign. James McFadden’s superb solo goal was the tasty icing on a somewhat bland, crumbling cake. Burley’s men took just one point from two games against a Norway side that are outside the world’s top forty and haven’t qualified for a major tournament since Euro 2000. The furore surrounding Chris Iwelumo’s astonishing close-range miss in the home match diverted attention away from a dire performance, a game in which keeper Craig Gordon rescued his country on several occasions. Burley’s team selection for the 4-0 defeat in Oslo baffled most observers, and the subsequent performance was alarmingly poor. The sending off of defender Gary Caldwell was unfortunate, but the resultant collapse was inexcusable. The two victories over Iceland were the least that could be expected against a team that finished bottom of the group with just one win. Despite a litany of errors and tactical misjudgements, Scotland could still have given themselves a chance with victory at home to the Dutch. It seems appropriately depressing that a misdirected header from David Weir, parachuted back into the international set-up by Burley at the age of 39, should lead to the late Dutch goal that ended Scotland’s World Cup dream. Another Burley gamble had backfired, and the qualification campaign lay in ruins. Burley was quick to praise his defeated troops, using words like pride and passion. I would have thought that pride in playing for your country and passion for the game are surely the minimum requirements, not qualities to be given high praise. The SFA used the same language of losers when justifying the decision to retain Burley’s services. They too spoke of passion and commitment, describing Burley as a man who deeply cares about his country. No mention of tactical nous, no reference to levels of performance. There is talk of heading in the right direction, but no evidence to back that up. Normally I would be the first to advocate managerial stability, but in this case I would make an exception. I fear the SFA and Burley are using sleight of hand to sell the loyal Tartan Army a qualification dream that cannot come true, and the rabbit’s set to stay rooted to the bottom of the Euro 2012 hat. 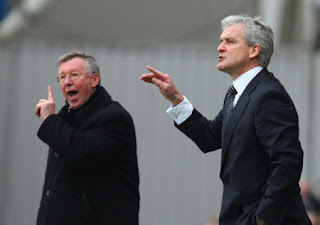 Sir Alex Ferguson's gloatfest after Manchester United's last-gasp win over City is a test of Mark Hughes' young blood. Hughes needs to muster all of his comparative inexperience to deflect Fergie's taunts and take the 4-3 defeat on the chin. Sir Alex disregarded City as "noisy neighbours" counting United's Liverpool games as the real local derby against a domestic City squabble. His words, just one more swipe in a week sprinkled with barbs slung from both sides of Manchester in the preamble to a 96-minute Old Trafford classic. And when Michael Owen won this derby the old streetfighter gave the game away. As Owen's goal hit the back of the net and Hughes attempted to decipher the logic of a winner being scored six minutes into four minutes of stoppage time, Fergie was almost lost in ecstasy. He charged around the touchline, jigging with players and staff - while also considerately sparing a thought for the stricken City fans with an emphatic and defiant double-clenched fist salute in their direction. Despite apparently playing down the signficance of the fixture, this meant a lot to Fergie. He wanted victory so badly to remind City where the power lies in Manchester and when he got it was happy to show his delight to the world. Hughes kept his composure in the aftermath of a contentious conclusion but issued an ominous warning to all, especially Ferguson, when he said: "We're not going away any time soon. We are around for a long time. I can assure everyone of that. We have got the means, resources and will to be better in the future and that is what we are going to do." If only Kevin Keegan had taken a chill pill that night, Newcastle fans would be looking back at a Premier League winning season today. Hughes' main bone of contention was how fourth official Alan Wiley's board went up for four minutes of stoppages and United struck well into the sixth. The explanation was the length of time City spent celebrating their third equaliser, plus a substitution - but it was not one that satisfied Hughes. The timings have since proved to be borderline but remember four minutes was a "minimum" and it should not be ignored that the time was added on for City as well as United. Their respective priorities in those extra minutes, however, were different. But for all of Sparky's contentions over timekeeping, the simple truth is that United fully deserved to win, despite a City performance that suggests they'll be a danger to the best this season. City needed to defend to the death, but two pieces of brilliance from Ryan Giggs and Michael Owen opened City up in a second. United's slick football did the talking. So Hughes must put this defeat into perspective. To use it as a flag in the sand by which he can measure future progress - and to remember the sharp pain of this kind of defeat so it doesn't happen so much in the future. Soccermongery detected an 'orrible streak in Terry long before his dalliance with Vannessa Perroncel. Here's a piece written during his on-off summer switch to Manchester City. There's something utterly repugnant about John Terry's ongoing flirtation with Manchester City. Always presented as the unlikely superstar product of Chelsea's youth team, we expected Terry to live upto the billing and be the unique example of a one-club man in the modern era. Maybe at 34, we mused that he'd sign a one-year deal at West Ham or QPR, but not before. No, the Champions-League-weeping, badge-kissing legend could be depended on to stay at Chelsea through thick and thin, whichever Spaniard or Italian he was paired with in the heart of the Blues defence. But it turns out, he's a mercenary like they are! Don't get me wrong, I support a player's right to go wherever he wants to pursue his career. I am delighted for Michael Owen in securing his dream move to Old Trafford after wandering hapless, half-injured at losing Newcastle. It is a short time in the limelight. But Terry does have everything at Chelsea. A massive salary, trophy's galore, a guaranteed challenge for silverware every season in every competition and a springboard to retain the England captaincy for years to come. No, this is entirely and only about money. City have offered him an outrageous pay deal - and a package to include a Charitable Trust in his name. But Terry will merely use Mark Hughes' ambition to bag a bigger deal with better terms at the Bridge. He tried it on in the last round of contract negotiations with a series of ridiculous demands including a ten-year deal, an option to become Chelsea manager at the end of his playing days and the right to be the highest paid at the club. And the fools at Chelsea will give him another payrise and concede to some of his demands. Of course, he won't be leaving Chelsea! I just hope the fans don't forget this. Sure, he'll turn in match-winning performances and they'll forget it all because they think he's committed to the core. But he's the prime example of a greedy footballer and Chelsea means less to him than his beloved fans think. Fergie's News Conferences are sometimes better than the game itself! I try to keep a football appointment every Friday lunchtime with Sir Alex Ferguson's pre-match news conference. I'm glued for his weighty growls born of weary experience, his gossipy views on other clubs and managers none of which are his goddamn business - and a gem of a quote from his industrial gob: Made In Govan! Despite his many years in the spotlight, he's often riled by the assembled hackery. The touchy subject of Real Madrid's unending pursuit of Cristiano Ronaldo had Fergie spitting, "I wouldn't sell Madrid a virus, let alone Ronaldo!" But the Govanator eventually did - and Real paid full retail price for the Portuguese. The sort of amount that even Sir Philip Green would've put a cigar on for. Other times, he's a master of the room. A few years back there was a ridiculous tabloid flyer in The Mirror alleging that Fergie was part of a consortium ready to takeover Manchester City. "Whassat gottae do with this? we're here to preview this game ... ! ", silence. A Fergie denial of any kind would've been printable as a follow-up but he's too canny for that. The story disappeared without trace the very next day - and his handling of it in that moment was the reason why. A few seasons ago, I was at Charlton for a United game and Fergie came out of the tunnel ten minutes to kick-off and continued a casual conversation on the touchline with an old football friend while scores of photographers snapped away. But it was like it wasn't happening around him. He totally blanked it. A measure of his years in the cauldron and the inner steel which shows he never lets the pressure cloud his own principles. Back in the Press Room, my favourite Fergie moment was ahead of a tough trip to Galatasaray, one of the most intimidating stadia in all of Europe. It was the first return to Istanbul since the acrimony of an Eric Cantona dismissal after the final whistle of a bad-tempered exchange. A thoroughly professional performance would be required this time to avoid similar ugly scenes. So a question came from the floor, "Are you at all concerned to return here with your big name players to a place of such open hostility?" Fergie's face was a picture. He replied, "Well, you've obviously never been to a wedding in Clydebank!" I tell you, if it's been a good week for football stories then try and catch Fergie's Friday Football Fare. He'll always deliver something to make you chuckle, unwitting or otherwise. As fans we've had to suffer frequent acts of petulant posturing from itinerant, ignorant footballers in the Premier League years. But we've surely not seen as disgusting a show as at Eastlands on Saturday involving Emmanuel Adabayor. The Manchester City striker was facing up to his former Arsenal teammates for the first time since his big-money move in the summer, and even before kick-off he seemed intent on looking for trouble. 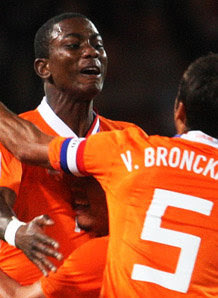 In drawing blood from his one-time strike partner Robin van Persie by raking his studs across the Dutchman's cheek, Adebayor showed what a low-life scumbag he truly is. Admittedly, van Persie did go in with a rumbustuous tackle which up-ended the giant Togolese striker - but it was merely a challenge in the context of the rough-and-tumble that is Premier League competition. 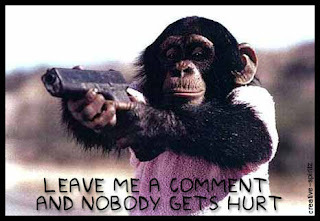 Adebayor's retaliatory action certainly was not. Then after scoring, Adebayor sprinted a full ninety yards to taunt Arsenal's visiting support. Unsurprisingly, it sparked off unrest among the travelling contingent. Missiles and insults were hurled - and you can't blame the fans for doing it. I only wish a Gooner had got onto the pitch and landed one on Adebayor's hooter. Instant natural justice would have been administered and we would have had to say no more about it. But unfortunately that didn't happen. Now the Premier League, the FA or even Manchester City should take action. Something that'll bring order and respect back to the game. Like a half-million pound fine and a twelve-match ban. What Adebayor did is just not on. His two headline grabbing actions will live long in the memory and if English football's to maintain some sort of integrity, the powers that be should severely censure him. England responded to the Wembley roar with an emphatic 5-1 win over poor Croatia. Fabio Capello's charges qualify for next summer's World Cup Finals with a 100% record. Eight matches, eight wins. Unlike the last time we faced Croatia; the rainy, gloomy 3-2 reverse which knocked us out before EURO 2008, England played without fear. The Croats were reduced to pass-and-move training monkeys. They had no response to the all-out fight, commitment and desire of a team which their coach Slaven Bilic had described before kick-off as "flawed" and "lacking Englishness". Are you 'avin' a larf, sunshine? What was so impressive was our organization and discipline. Every player knew his role and while some might criticise Capello for stifling flair, no one can argue with the growing sense of purpose and command England have these days. We're not blessed with a huge pool of striking talent these days, which is why it's so important goals come from midfield. A brace each for Frank Lampard and Steven Gerrard, while Aaron Lennon was Man Of The Match. But England's World Cup work in progress must extend to defence. We still have occasional lapses of concentration at the back. Conceding against both Slovenia and Croatia shows we could be well and truly punished by bigger and better teams. But make no mistake, we qualify for South Africa with strength and vigour and with the hallmark of Capello running through the whole team: "you don't have to like me, you don't even have to respect me, you just need to do as I say!". I know England's 2-1 win over Slovenia was just a friendly and that you can only beat the opposition put in front of you, but Saturday's Wembley show wasn't good enough. Fabio Capello must instill in his team a greater sense of urgency if we're to earn a decent result against Croatia and qualify for next summer's World Cup Finals. Slovenia passed and moved nicely enough - but frankly, England allowed it and the visitors deserved their late consolation goal. We've seen England lose their way after lacklustre friendly displays. I had the indignity of schlepping to the Parken Stadium in Copenhagen to watch our 4-1 mauling by Denmark in 2005. Although, Sven sent out a virtually different England side in the second-half with a mammoth selection of substitutions that night, it remained our heaviest defeat for 25 years. With nerves well and truly jangled, the defeat spilled over into our next competitive game as England got the shakes in Northern Ireland, losing 1-nil and putting the skates under our potential to qualify for the World Cup. Luckily we did, but it was on the backfoot. That's why we've got to snap out of it. Get among the tackles, the man-marking, be first to the loose ball. This is England. This is Wembley. This is a place in the World Cup Finals. We've already thumped Croatia 4-1 earlier in the group. Theo Walcott's hattrick exorcised the ghost of New Wembley when the Man with the Umbrella saw his charges lose 3-2 to the Croatians, so failing to qualify for EURO 2008. Slaven Bilic is almost Mourinho-esque in some of his news conference deliberations, but branding our boys as flawed and lacking Englishness, provides Fabio with all the material he needs for his pre-match talk! So Forza England! Capello needs to gee the boys up with some early pressure and preferably a decent half-time lead to set us up for the big project: South Africa 2010. There can be no lagging at international level.